Chris Lehman - ALBANY THERAPEUTIC RIDING CENTER, INC.
Chris Lehman is the founder of Albany Therapeutic Riding Center, Inc. and serves as our board president. Chris is the heartbeat of ATRC, giving countless hours to care for the animals and facilities, prepare for lessons, conduct outreach and fundraising activities, and as our Certified Riding Instructor. Chris is an Albany, NY native and was educated at SUNY Delhi. Chris worked for many years as a licensed veterinary technician and also was a microlab instructor at Columbia-Greene Community College. 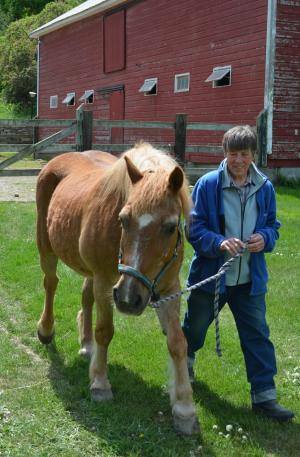 Chris has over 34 years of experience in therapeutic riding and holds current advanced certification in cognitive and physical disabilities . In 2013, Chris was recognized as Volunteer of the Year by the Schenectady Gazette and Direct Energy. Compassionate and caring, Chris loves the students and enjoys making a difference in their lives. Chris is truly an example of an ordinary person doing extraordinary things!